Posted: Wednesday 24th October 2018 in Owned and earned media, Paid Media, Performance Marketing, Retail Strategy, Thought Leadership. With all this conversation around peak trading, it’s time to start bringing the planning to life for ecommerce retailers. A lot of hard work and effort has to go into the planning and it therefore has to start well in advance to be able to see any kind of positive results. What exactly goes into the planning for the busiest time of the year? Here we will discuss in detail how different channels begin to prepare for peak, key personas and customer journeys that need to be considered and how different channels can work together to maximise performance. Each marketing channel varies in the way they work over peak. For some channels, most of their work is carried out early on, whereas some will mainly focus around Black Friday and Christmas, and some will be constant throughout. Search engine optimisation (SEO) teams have a very front-loaded peak because of the time it takes to see impact, meaning most of their work is carried out in the run up to peak and during early peak, but they will also spend time monitoring and adjusting or supporting with content or insights throughout the whole period. Trading is constantly on throughout the whole peak period. A lot of their core strategy will start early, and other phases will be reactive due to aspects such as the weather, competitor activity and stock levels. Paid activity is always on in some form or another due to the planning of promotions. However, the majority of paid work is very much focused around Black Friday and Christmas. The peak activity for the affiliates team tends to go hand in hand with paid media as their work will be reactive to performance and what competitors are doing. However, their planning and agreements are done in the run to peak. It’s more important than ever to have a peak-focused strategy across all digital marketing channels, and the focuses vary within each. Each channel has a different set of responsibilities they have to consider during the peak period. For technical SEO, the teams have to check with developers to see if they are going into a code freeze and what will be needed if so, and for content marketing it’s all about the campaign planning and execution, as well as ecommerce optimisation on peak pages. For the ecommerce and trading teams, competitor analysis is a key consideration over peak. They need to carry out daily checks to ensure their brand is always on top. They also need to make sure they have clear and detailed plans and establish how much extra resource will be required from other channels to achieve the impact that is expected. The paid media team need to ensure they define key dates and peak budgets and KPIs. They must define their strategy audience, plan their creatives and monitor competitors. It’s also important to increase business as usual tasks during peak, and to have constant communication with stakeholders. The key consideration for affiliates is to ensure that their creative messaging and budget activity is planned in advance, and then throughout peak they should increase their business as usual tasks, whilst monitoring competitors and making adjustments in line with stock levels. For a more detailed description of the different focuses within each channel, take a look at our peak digital marketing channel considerations article. We all know it’s important to know your target audience, and this is even more important over peak. You need to understand your customers’ journeys both online and offline to be able to get your products in front of the right people. Take a look at the 3 personas we believe to be the key UK Christmas shoppers and how they move through the peak period below. The bargain hunter is someone that tends to be price driven and always looking for the best deals and ways to save money. They tend to have a clear idea of what they want to buy, however, they can often be swayed to purchase more if there are promotions involved. They have multiple online touch points and are thorough researchers, constantly looking for the best promotions and deals. Their shopping behaviour is focused around sale periods and they tend to have low brand affinity because they care most about cheaper prices. In the run up to peak (July – September) and half way through early peak (October – early November), this kind of shopper starts to sign up to email newsletters for early promotion notifications to make sure they’re first to know about any sales. Then as early peak starts to come to an end and we head into Black Friday, they stay up late and wake up early to browse the best deals online. As Cyber Weekend continues, and we start to head towards Christmas, the bargain hunter clicks through on paid related messaging via search & display and tends to compare competitor prices on items at product level. They’ll also check affiliate sites to see if there are any cash back offers to help them save even more money. From Black Friday right through to January bargains, this shopper will click through on social and display promotions for additional purchase offers, as well as adding additional products to their basket in order to reach the free delivery threshold. Finally, throughout January sales they will search through the sales looking for any post-Christmas bargains. The early shopper is very organised and has a budget that they are conscious about sticking to. They tend to carry out the majority of their research online but make their purchases in-store. 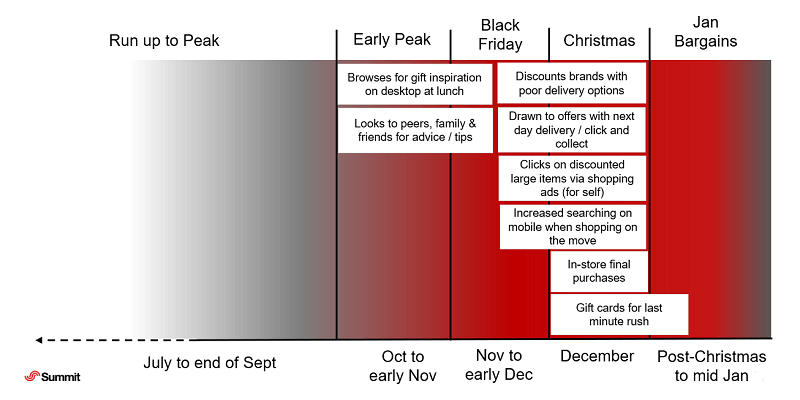 The early shopper’s activity is very much focused around the run up to peak and early peak. In this time, they will engage with their favourite brands via email and social, and will check retailers’ blogs to look for content inspiration such as gift guides to collect a bundle of ideas. This kind of shopper will carry out the research very early on, adding items into their wish list, and will start making purchases from September as they aren’t as influenced by sale periods unless it’s for high value items. They tend to check their favourite brands’ sale pages regularly as they are still budget-conscious, and they will start to go in-store for expertise or in-person purchases, but if they are going to purchase online, they will do this from trusted brands directly through their desktop in the evenings. They will make their absolute last purchases in the Black Friday sale which will complete their Christmas shopping, and then as January sales come into action they will start to browse and purchase in advance for next year. As the name suggests, this kind of shopper is very time short as they are so last-minute, so they end up making fast decisions. They often end up making purchases in store due to the last-minute nature, but also tend to use click & collect and next day delivery options. There is no activity during the run up to peak for this kind of shopper. During early peak they will start to speak with friends and family for some advice and tips, and maybe browse for gift inspiration on their desktop at lunch but they won’t make any purchases. Black Friday for the last-minute shopper is all about making big purchases for self-gifting rather than for other people. As Black Friday leads into Christmas they will look at discounted brands, but these tend to have poor delivery options, so they are drawn to offers with next day delivery or click and collect options. Their searching will start to increase on their mobile when they are on the move as they are so short for time. The Christmas period is when they will make their final purchases. These end up being made in-store due to delivery timeframes, and they will also opt for gift cards because of the last-minute rush and panic. A cross-channel approach is crucial for success over peak. Each channel must work together during planning, creating and reporting to maximise performance. Communication is key for this; a lack of communication may lead to be a misunderstanding across channels and mistakes may be made or opportunities missed. All channels must review performance targets and expectations together and discuss resource requirements for overarching strategy. PPC, SEO and trading teams should share with each other traffic-driving categories over peak, e.g. what performed well last year. For example, this would allow the SEO team to plan and prioritise their focus areas. All channels should share with each other what they’re creating over peak, whether this is the paid team sharing their creative message and audience strategy to ensure everything is consistent, the trading team sharing their creative designs, or the SEO team updating and supporting peak pages. Understanding the role each channel plays in the sales funnel over peak allows everyone to understand the true impact and value of the channel tactics over this period. PPC and SEO teams should combine category reporting views and analyse as part of performance tracking throughout peak. Reporting also allows all channels to review performance against forecast. To ensure a strong digital marketing strategy, thorough planning is needed, and it needs to begin well in advance. For us, peak starts in June as this is when the serious planning begins. Having a detailed plan, channel synergy and excellent communication is key to achieving strong performance and a very successful peak.